Georgia Hydrant Services, Inc. was opened in 1999 as a fire hydrant repair and maintenance company. Since that time we have strived to provide our customers with the best service possible. Along the way we have evolved into much more than a fire hydrant business. We have worked with various municipalities and manufacturers to upgrade and install radio read water meters. We have purchased an Insertion Valve machine that has (more than once) saved many contractors and water departments time, headache, money, embarrassment, and more importantly WATER! 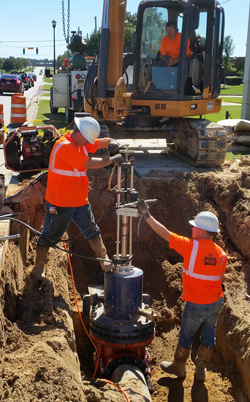 All of these services along with back-flow testing and installation, underground utility work, hot taps, pressure testing and chlorination makes us your one call company. No matter what your needs are, we at Georgia Hydrant Services are here to help. So contact us today, and don’t forget to ask about our reconditioned fire hydrant parts.